Dali Callisto 6 C / Dali Sound Hub review | What Hi-Fi? Owning a premium hi-fi has always carried with it a certain amount of compromise. You get great sound, but you also have to put up with a multitude of electronic boxes and the spaghetti of cabling it takes to get them working. By the time outboard power supplies and other add-ons are included in the equation, it’s not unusual to for the box count of a quality stereo system to register in double figures. Dali’s Callisto range of premium wireless speakers is intended to get around such issues, and to a large extent it succeeds. There are two options in the range – the smaller standmount Callisto 2 Cs lose out on a dedicated bass driver and a chunk of cabinet volume to the floorstanders we’re reviewing here. If you have a larger room, or crave a presentation full of authority and scale, the 6 C towers are definitely the way to go. Dali has gone for an engineered look with these floorstanders. The appearance is a little cluttered, and perhaps doesn’t quite exude the luxurious aura expected of speakers at this level. But the 6 Cs are much more than just speakers, and shouldn’t be compared to typical passive alternatives available for a similar price. Each of those metre high cabinets houses a pair of Class D power amplifiers, a clever hybrid active/passive crossover coupled to a 24-bit DSP and all the bits required to make wireless work. These hidden extras rarely come cheaply. 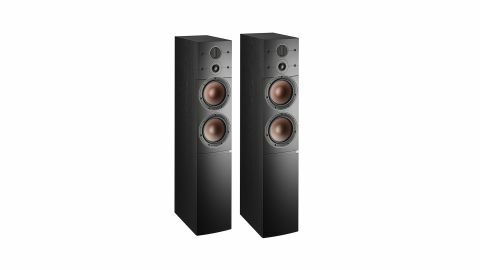 Dali describes these active floorstanders as having a 2.5-way, plus a 0.5-way configuration – something we can’t recall coming across before. Firstly, there are two tweeters. A 29mm soft dome handles the signal up to around 15kHz, when the 17 x 45 mm ribbon tweeter takes over. The idea is to produce detailed highs while keeping a nice, wide dispersion right to the 30kHz upper frequency limit. Add the 16.5cm wood fibre mid/bass unit (the upper of the two larger drivers) and you have a 2.5-way design. The additional 0.5-way takes the form of the lower 16.5cm bass driver that is fed through a simple analogue filter. The main crossover split, done at 2.6kHz and taking place between the mid/bass unit and dome tweeter, is done digitally. We haven’t come across a speaker design that mixes both DSP and analogue in its crossover this way. There are two amplifiers in each enclosure – one to drive the tweeters and the other to power both larger drivers. These Class D amplifiers are rated at a maximum of a seemingly modest 30W continuous output, but can deliver up to 250W for up to five seconds. This, Dali claims, is enough to deliver large dynamic shifts without issues, making the 6 Cs sound considerably more powerful than the baseline power figure suggests. These floorstanders will look at home in most medium to large rooms. They’re nicely built, with slim cabinets made of 25mm MDF and heavily braced to add rigidity. Finishes are limited to black or white vinyl options and on our early samples the fit is spot on. The company has added some nice touches, such as the ability to change volume by moving your finger on the front edge of the top panel. The volume level is shown by a row of bright LEDs below the bass driver. While the Callistos can accept a wired single-ended analogue signal directly from a conventional preamp, they aren’t intended to be used in that way. To get the most from these speakers, you’ll need to buy Dali’s Sound Hub, essentially a preamp that connects to the speakers wirelessly, at an extra cost of £549. The transmission between the two is done at 24-bit/96kHz and the company has taken much care to ensure low latency to avoid lip sync issues with video sources. The Sound Hub offers a wide range of inputs, from two analogue options in the form of stereo RCA and a 3.5mm jack to a pair of opticals and a coax. AptX HD Bluetooth is also here, and – as if to cover all bases – the Sound Hub has analogue stereo and a subwoofer output. If you want to use it as a conventional wired preamp you can, though that rather defeats the point of the Callistos. Take a look at the Sound Hub’s back panel and you’ll find two blanking plates for add-on modules. At the moment, the only one available is a network and streaming board that uses technology from Bluesound. Spend an extra £459 here and your Dali Callisto 6 Cs can be integrated seamlessly into a Bluesound ecosystem, as well as enjoy network streaming and embedded streaming services from the likes of Tidal, Qobuz and Deezer. We’re a little undecided about the Sound Hub physically. Its predominantly plastic casework lacks a bit of substance, but the glass top plate and simple but classy appearance appeals. The Sound Hub is also easy to use and comes with a nice, uncluttered remote. The digital volume display in the middle of the smooth rotating volume control is a pleasing touch. For some, the Callisto 6 Cs plus a Bluesound-equipped Sound Hub could be all the hi-fi they will ever need. A traditional separates system has no chance of matching the neatness and lack of clutter of such a set-up. While the Dali isn’t truly wireless – you still have mains power going to each of the speakers and the Hub – it’s notably tidier and more flexible in placement than conventional passive alternatives. It doesn’t take us long to position the speakers properly. We place them around a metre away from the back wall of our listening room and fire them straight ahead, rather than point at the listening position. This is how Dali designs its speakers to be heard and it helps with dispersion and soundstage width. We start with Bluetooth from our Apple iPhone 8 Plus, and the connection is quick and fuss free, and the presentation pleasing. But despite the use of aptX HD, the overall sound lacks the insight and dynamic subtlety we would expect from a quality hi-fi source. However, the Dali package still manages to keep enough of the energy and drive of the music to keep us listening. We play Bruce Springsteen’s The Rising set and the Callistos deliver a good chunk of the Boss’s renowned passion. Despite that modest-sounding power output, these speakers are fully capable of filling a large room, powering through basslines, large volume shifts and drum strikes with confidence. Switching to the line level input and using our Naim NDS/555PS music streamer improves the performance massively. The speakers sound much more transparent, tracking dynamic nuances with the skill of quality separates. We play Orff’s Carmina Burana at high volume levels and are impressed by the control and composure on show, as well as the grip at low frequencies. Bass is delivered with precision, agility and texture. The Dalis image well too, layering an expansive soundstage with focus and care. Orff doesn’t hold back in this piece, but the imaging stays stable, even when the music gets demanding. Tonally, things are nice and even. Dali's speakers don’t tend to be shy at high frequencies and that continues to be the case here. The dome and ribbon tweeter array produces such an insightful and refined sound that even harsh recordings remain listenable. The Callistos are still revealing enough to show up flaws in recordings or source components, but they don’t go out of their way to emphasise any such shortcomings. But that transparency turns out to be a bit of a liability when we try out the optional Bluesound module fitted to our sample of the Sound Hub. We are impressed by the way Dali has seamlessly integrated this technology into the Callistos. The company uses the Bluesound app, which is one of the better pieces of control software we’ve tried, and of course offers the user the option to stream from a NAS unit connected to their network or listen to the millions of tracks available from the likes of Tidal. As such, it’s a useful addition to the Dali package and, at £459, represents decent value for its features alone. The Bluesound Node 2i, our favourite affordable streamer, uses similar technology and has pretty much the same features, but for an extra £40 cost, and the added clutter of another box and pair of interconnects. Our issue is that the performance of the Bluesound module may be considered impressive for an affordable streamer, but it still isn’t good enough to show just how capable the speakers are. If you buy the 6 Cs and only use the Sound Hub with the Bluesound module fitted as your main source, you’ll be missing out. The module’s presentation may be balanced, full-bodied and refined, but it doesn’t have the expression or finesse the speakers deserve. Disappointingly, we feel the same way about the Hub’s digital inputs – the sound through these similarly fails to excite. It’s neat and relatively detailed, balancing the frequency extremes well, but it’s also a little ordinary. Dali has a reputation for building excellent speakers – witness the number of What Hi-Fi? Awards the company has won over the years – but the electronics side of this package needs to improve to get the best from the Callistos. None of this stops the Callisto 6 C/Sound Hub combination from appealing. It may not be uniformly excellent, but its performance through the line inputs is terrific and the convenience of Bluetooth and the built-in streaming module cannot be denied. If you want a performance close to that of premium separates but with reduced clutter, there are few other alternatives.